This is my first post of 2010. As I had said in my last post in December, this year I am focusing on money dicipline and high probability low risk trades this year. In that goal, I will be posting explanations to the trade setups I post, not just the setup and result. I have come to firmly believe and embrace that a good trader is a consistently consistent trader, which infers that there is a pattern to a good traders results. Following that through, one needs to have an arsenal of singles and doubles that work more times that not, and if not, are not game ending. This is key, being able to survive a series of bad trades without being tempted to go for the home run trade on a weak setup and ending the game (margin calling or worse). Sometimes standing aside is the best course of action. There is no stat that matters more than keeping your trading capital. This is one of my favorite trades and is easy to spot, stops are clear cut, and target goals are easy to set up. I call it the 62 bounce, and I trade this on the 1 hour time-frame chart. Here is the trade (the pivots on the chart are the next days, but look at the notations to understand the original trade). There are two conditions that have to be met for this trade to be a valid setup. First, at a minimum there has to be a trend that was in place recently and second, that trend is confirmed by the 62 EMA and 200 SMA in phase with the trend. I also use the 144 EMA on my charts as well as the 800 SMA. For a longer term trend, the 800 SMA will also be in phase with the dominant trend, but for a shorter trade, I am o.k. with just the 62 and 200 trending together in phase. The trade sets up when price falls to the 62 and bounces off it. That is it. The basic trade. Take the trade in the direction of the original trend. If a wick penetrates and the next candle moves back that is still a valid setup. They key is to confirm that the 62 is acting as strong resistance to price. If you look at the chart, you will see several 62 bounces that set up. All but the last one would have been able to be closed at a profit. I also look for confirming signals as well as some basic support and resistance setups to target stops and profit targets. This is a 30 to 50 pip trade for me on this pair. If you look at the entry I chose you will see the gradual decline from a 2 bar reactionary move. Then the smaller less convicted bars just retracing the earlier movement. If you analyze the time of day you’ll also notice that the retracement happened during low volume time periods and the start and follow trough of the bounce happened at the Asian session, then took off during the Eurpoean session, and retraced in the U.S. morning session and followed through. That is another key thing I watch for, inter session give and take. I hope this gives you a bit of insight into one of my favorite trades, but be very aware that this is a short term trade setup. Take it, get your 30-50 pips and get out. Look for reversals and test riding back to the 62 as well (I also took some pips as it reversed in the US session). I have been watching the movement of several currency pairs over the past few months to determine the most statistically reliable intraday price movements. One movement I have been very interested in is the pre-Chicago closing (usually starts around 1430 +/-) and then the post Chicago close after 1500. I have observed that prior to the close, a reliable movement takes place opposite the dominant session trend, and many times reverses quickly and hard after 1500. 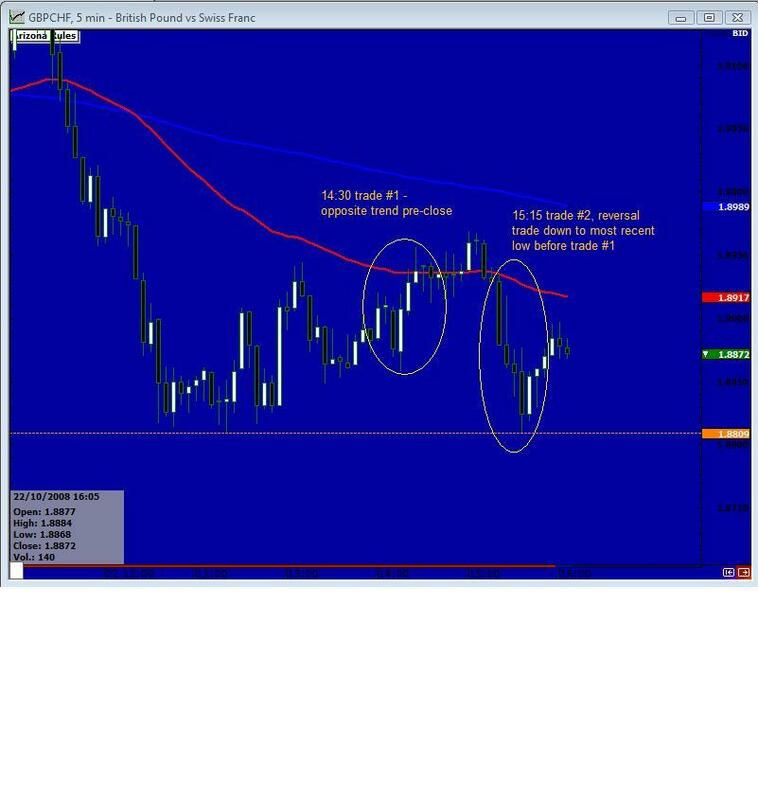 The trade below is a trade using that idea that netted 94 PIPS with two quick trades. I had a bad entry on the first trade and got out a bit early otherwise the PIPS would have been considerably more. 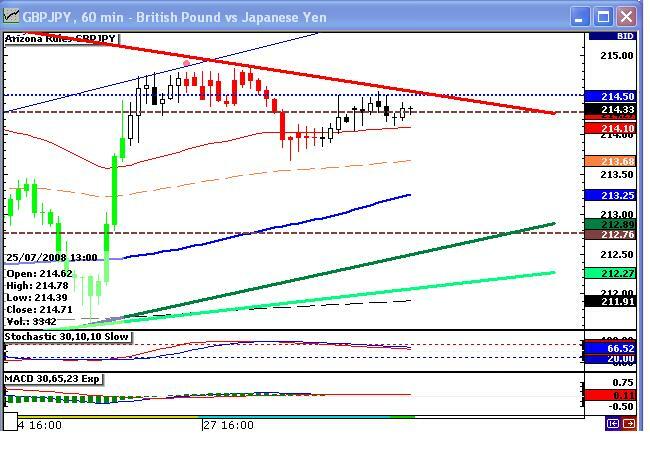 The same patterns were also observable on the GBPUSD and GBPJPY during the same times as well as on the EURUSD. I am currently backtesting this trade idea extensively as well as studying the time of day per currency pair that show the most movement (best times to trade) and the average range of this movement as far down as 5 minute to 5 minute timelines to find correlations. Opened a short trade on the 1 hour on NZDUSD. A support/resistance zone is currently in place between the 800 MA and the 144 MA. Trade is just to the 144, with a tight stop above the 800. Opened @ .6856 with SL @ .6887 and profit target @ .6805. I have a larger Surprise Box on this pair as well, if the pair closes below the 144, I will keep trading short with a stop above the 144. After the exceptional volatility of the past week, a large downward channel is starting to develop. I have no predictions if it will hold, or what volatility will be over the next few days due to the ongoing U.S. financial market bailout congressional hearings. I am shorting at the top of the most recent touch of the channel down to the mid level fibble with a target of 1.4625. My Stop loss is 1.4744. I suspect that either I will be stopped out above the channel due to some whip saw candles during the European openings, or the opposite, I will get filled at my target profit. If I am awake and the trade is moving in my directions and closes below the middle fibble, I would lock in profit and extend down to 1.4577. I have a downward bias for this pair for the medium term, but am not willing to give up profits in the short term due to high volatility. September 2008: Wow – this was one heck of a call. I missed most of the move because I thought I missed the break initially. Looking back with 20/20 hindsight this was one of the trades of the year. As I write this, the pair has retraced back to the 62 MA on the daily which is at 1.4888 after reaching a multi-year low of 1.3880. Once the U.S. market shock works its way out of the system, I will be watching for a break downward again. I am very cautious nearterm due to recent and expected volatility as we deal with the banking / mortgage/ credit/ economic crisis in the u.s. Long term I think there is a strong arguement for the pair to fall below the most recent low. This time I will be taking very small probing possitions until I catch the eventual trend down again. Or we hope! 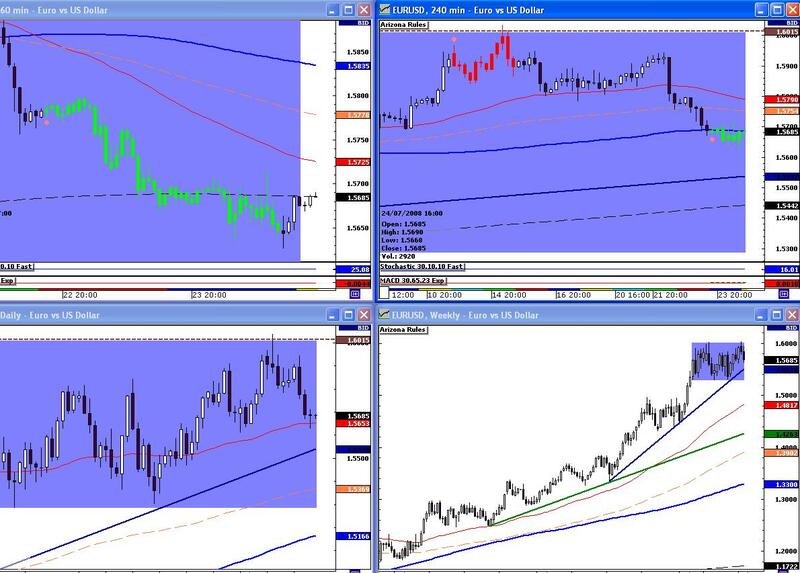 EURUSD Daily and Weekly charts show an interesting range that form a perfect Surprise box. This is a large timeframe for a surprise trade, but really shows the range this pair has been trading in. Add to this a recent break downward and two long standing Trend Lines and we have a large potential short trade setting up. This is really a continuation trade of the EURUSD trade I entered on July 23rd and closed earlier today. I have a probing position on now that I opened after a bounce back to the 800 on the 60Min chart. This may take a few entries to catch the ride down. I am not planning on risking much on my probing entries. If I catch a trend I’ll add to it. UPDATE 25July08Pre US Open: I had two probing possitions on. The pair reversed and traded through the 62 and has almost touched the 144. One of my possitions closed. I am keeping a single possition on and raised my SL to 10 pips above the 144. If this gets taken out that will be the last attempt for this week and I will again be in watch an wait mode. I am not willing to take a large SL possition on this trade over the weekend right now even with a small possition. Too much going on politically and I don’t want a surprise gap! I’d rather take a few small probes and wait to catch a run down when it eventually happens. Which it will at some point – 1 day, 1 week, 1 month, 1 year… As I tell my wife, trading is really simple, it either goes up or goes down, I can’t tell you which way it will go, only what I will do when it does. UPDATE 25July08 Mid NY Session: the pair expectedly rose at the European close, then fell again below the 800. I put a tight stop with a continution profit target to the nearest SR line. The pair rose quickly to the 62 on the 60M and I am now out of this trade for now. My last probing entry was profitable around 60+ PIPS. The overall setup remains valid and on my watch list but I do not want to be exposed over the weekend. I don’t like paying interest either unless I am deep in the money with a good trend catch. UPDATE 29July08 – as we enter the Asian session, you can see that the long term trendline is being hit. I am now watching for either a bounce or a break below. If we break below, then we may be ready to start a new trend. With so much fundamental news these days, any longer term position entry will be probing (small) and again, I’d rather take a few small losses until I catch a trend than one or two ill timed wrong ones! Update 31July08 – took a few probing trades the past few days. Thought I finally had the trend and got stopped out due to new this morning. Once the dust settled, I re-entered the trade and added to the position thoughout the day. Took half off just before the Asian rollover and have a tight 15 PIP loss in case the Eurpean session retraces the move. I don’t normally keep trades open over the weekend and tomorrow is Friday, so either way I will close this trade out for the week. Update 1AUG08 – Friday morning NFP report and some other news announcements are expected. This trade held a very tight range overnight in expectation of the data release. I closed the remaining 2 possitions out around 7:45. Good call as my stops would have been touched during the news release spikes. The pair eventually settled back into it’s previous range. Trade on hold for the weekend. I’d like to see a break below the most recent low before re-entering. I will also consider an entry below the 62 on bearish candles on the 1 hour. 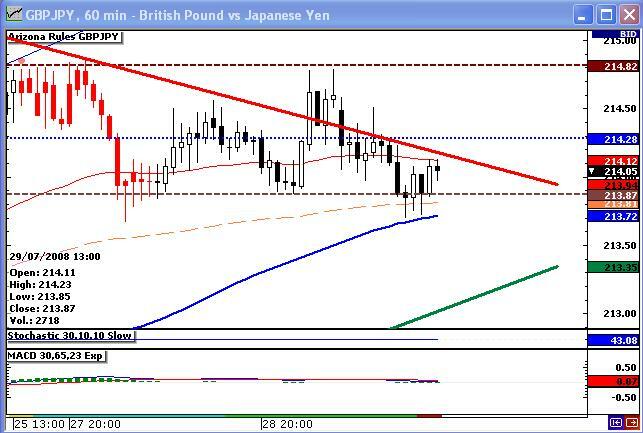 GBPJPY – Friday 1AUG08:- my last trade on this pair closed out Friday morning when it hit the 800 SMA on the 1 hour. This pair has bounced off the 800 twice recently. This is a heads up to start looking for Divergent trade setups. Nothing currently, but watch the pair as the week opens to see if we get any good setups. UPDATE Tuesday 5AUG08: I took two trades off this setup. The first was a quick SR trade Sunday night. Pair was in a range between the 800 and about 30 PIPS below. 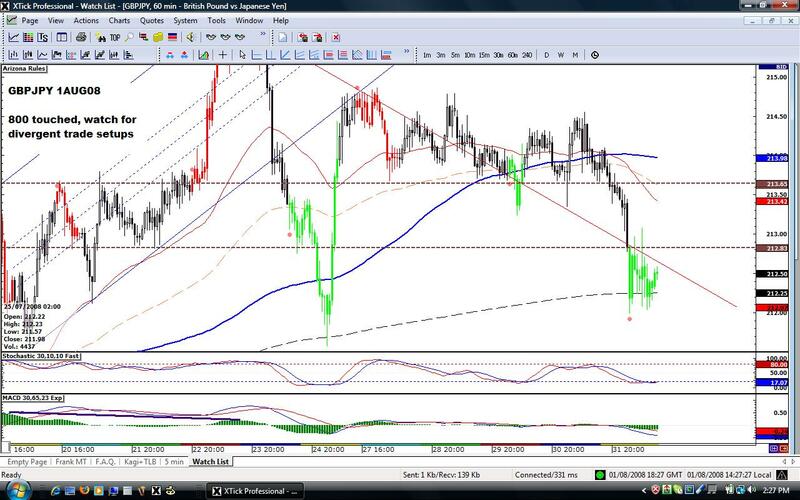 I took a quick trade on a downward movement that closed overnight for a gain of about 30 PIPS. Monday night, the pair broke the long term SR level and the 800. Entered on a bearish candle that closed below the 800. I had 2 short positions on that were not doing much before the 12:00 a.m. rollover. I felt strong about the overall trade, but due to the FED data coming out Tuesday I did not want to risk a fast spike up/down in anticipation so I took off one position. I ended up +98 PIPS in the a.m. when I woke up. Dissapointed I lightened the position, but I slept much better. I have learned the hard way it is more important to give up some potential PIPS to protect your account balance. 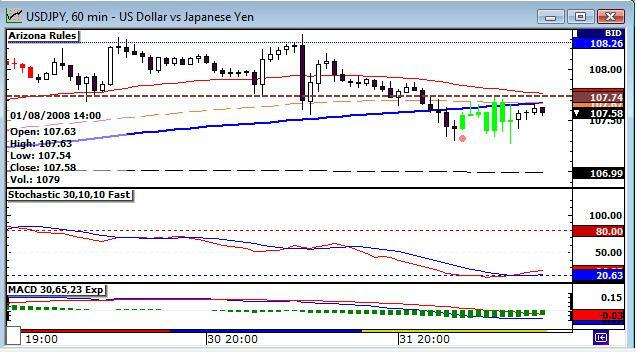 USDJPY Friday 1AUG08: The pair had a Stochastic cross on the 1 hour but it was oversold and the candles did not cross the 200 yet. I am watching to see if the pair can cross the 200 SMA for a possible trend resumption and confirm by closing above the 62 EMA. This would be a good probe for a probing trade with the still in place upward trend. Goal 50 to 100 pips. This is a watch an wait setup for next week. UPDATE Monday 2AUG08: I took a probing trade on a Stochastic cross and oversold candles but closed it when I saw strong upward movement for a small loss. Good call as the pair continued upward for many candles. 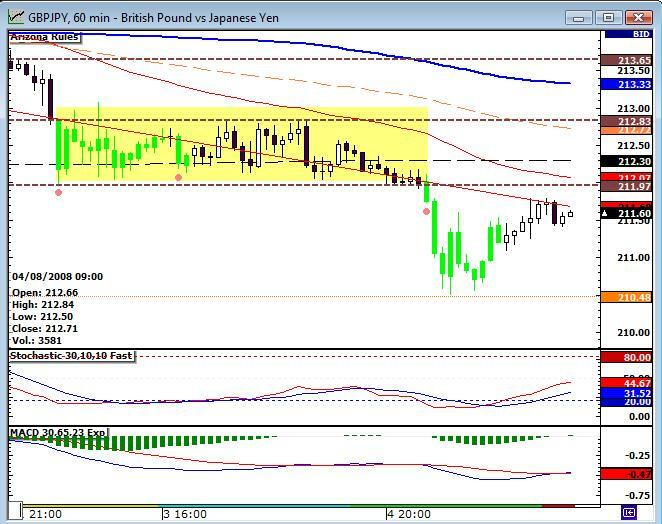 GBPJPY Support/Resistance trade – This is really a continuation of a trade setup from last week that closed out. We had a Channel breakout to the downside last week and traded it down to the 800 SMA on the 1 hour chart. I then took a few probing short trades that stopped out, only to realize price was heading up to the bottom the old Channel, which is exactly where it stopped. Now, we have some clear SR trendlines in place. I think there is more of a chance of it breaking to the downside based on trendlines and oversold indicators. I built a small possition overnight (was stopped out first but eventually found the correct levels) and woke up to 70+ PIPS on a small position. I then doubled up (still below my normal trade size), and moved my SL down to 25 PIPS above the most recent SR line. I was taken out at a 4 PIP profit – B/E. If you look at my last GBPJPY trade idea you can see a good view of the previous Channel and subsequent break out downwards. After drawing the new downward TL that is now in place, I think I found the TL that price is following. I again have a small exploratory trade on that is in a tight 25 PIP range for most of the day. If price breaks the TL and eventually the old Channel, I may consider a trade up to the old most recent high. The current trade is short back down to the lowest most recent SR level as Target 1, and Target 2 is just above the 800 SMA on the 1 Hour. 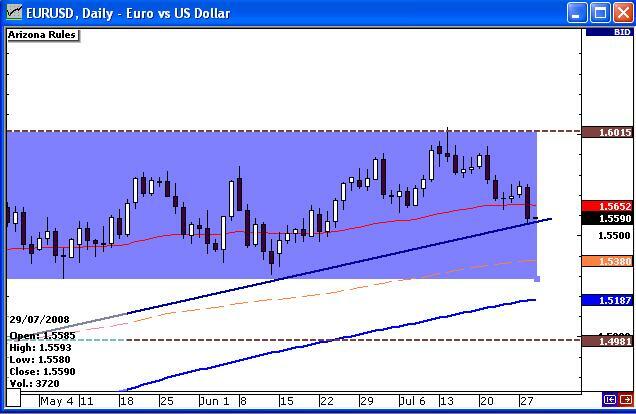 UPDATE 29JULY08 – This trade significantly broke the channel on the upward side overnight and stopped out. I decided to take another short probing entry this morning, all in all I have broke even less a few pips after I closed that possition once it touched the 200 and started to retrace. I am now flat in this pair and am watching to see if the pair can close below the 200 on the 1 Hour. If the risk reward ratio still looks good I may consider another small possition trying to get to the 800. Otherwise this trade idea is over. UPATE 30July08 – This trade is closed for now. The pair spiked up overnight and hit my stops. I still think it is biased to the downside but unless it breaks the long term SL line on the daily, I am not going to re-enter for the time being. 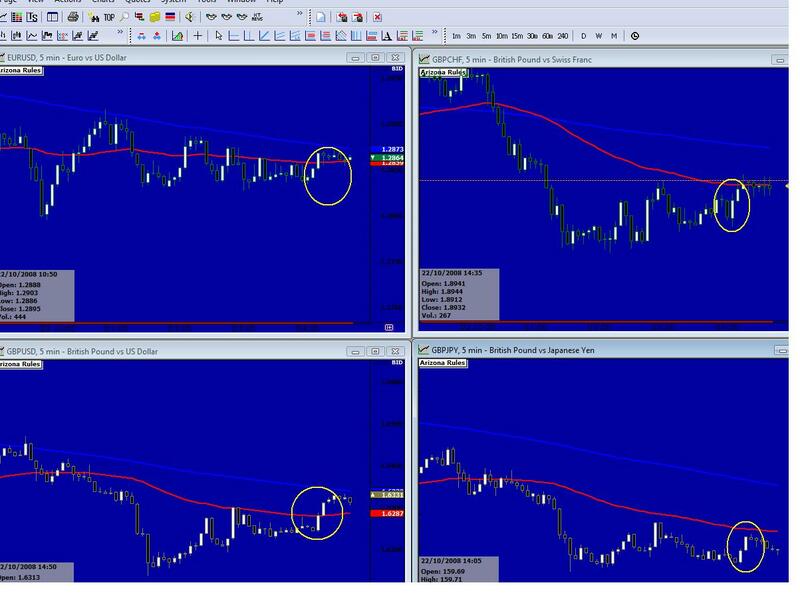 UPDATE 31July08 – Trade setup started trending down, re-opened. Trade is hitting long term trendline. If breaks, I believe this one will run far. I have a small probing trade on now as the Asian session is winding down. UPATE 1AUG08 – Pair broke through the bottom of the box and shot down to the 800 overnight. My targets were hit and this trade is now closed. 100 PIPS while I was sleeping – nice!